In the past few months, we all looked on in dismay and profound sadness as we read and heard the news about earthquakes in Haiti and Chile. The differences between lives lost and property damage from earthquakes are unequivocally related to the enforcement, or lack of enforcement, of building safety codes. Chile’s quake was a 8.8 magnitude, 500 times more powerful than the earthquake that hit Haiti but its toll in both lives lost and property damage was nowhere near as devastating. Chile, like the United States, uses and enforces building codes. Unfortunately, even in our own country there is a tendency to ignore the obvious. About 200 years ago, four major quakes ranging from 7.0 to 8.0 hit the New Madrid region, covering eight states, including the cities of Memphis (Tenn.), Nashville (Tenn.), St. Louis and Little Rock (Ark. ), causing the Mississippi River to run upstream and church bells to ring in Boston. We know that a similar quake in this region today would be one of the worst disasters in American history causing tens of thousands of deaths, displacing hundreds of thousands, not to mention the hundreds of billions in economic losses. And yet despite everything we have witnessed and everything we know, code officials in the New Madrid region of our country are struggling to persuade local and state governments to keep the seismic provisions that are in the codes developed by the International Code Council and used throughout the nation. Building smart saves lives and money. Let’s not be penny-wise and pound-foolish. Structural material manufacturers with an eye on the penny (and the pound) should take note. Building code requirements almost always tighten after major disasters. 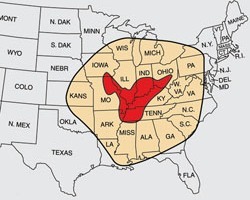 There may be more Midwestern opportunities, in the near future, to sell products that contribute to seismic safety.